Could Pluto hide liquid water far beneath its surface? After a journey lasting nine-and-a-half years, NASA's New Horizons spacecraft finally reached the distant world of Pluto. The three-billion-mile expedition culminated with New Horizons sweeping a mere 7,800 miles (12,500 kilometers) above Pluto's surface. On August 26, 2015, New Horizons team members Richard Binzel of the Kavli Institute for Astrophysics and Space Research at the Massachusetts Institute of Technology (MIT) and Cathy Olkin of the Southwest Research Institute (SRI), along with Kavli Prize Laureate Michael Brown of the California Institute of Technology, joined The Kavli Foundation for a live discussion. These planetary scientists answered questions about the mechanisms that might be shaping Pluto's landscape and what this strange new world can tell us about the other bodies at the solar system's fringes. Richard Binzel— is a professor of planetary sciences in the MIT department of Earth, Atmosphere and Planetary Sciences, and a member of the MIT Kavli Institute for Astrophysics and Space Research (MKI). He is a co-investigator on the New Horizons mission and has studied the Pluto-Charon system for 35 years. Cathy Olkin— is a principal scientist at the Southwest Research Institute (SWRI) and a deputy project scientist for the New Horizons mission. Her planetary science interests include the study of the icy surfaces and tenuous atmospheres of outer solar system worlds. Michael Brown— is a professor of planetary astronomy at the California Institute of Technology and the 2012 Kavli Prize Laureate in Astrophysics for his research on the Kuiper Belt. His research specialty is the discovery and study of bodies at the edge of the solar system. Richard Binzel: I think it's just seeing how dynamic Pluto is. As you said, we expected some smooth regions and some heavily cratered regions, but just to see the contrast of bright smooth regions right next to dark cratered regions, I think that's the real surprise. Cathy Olkin: One thing that stood out to me is this region we informally call Tombaugh Regio. It's this large, bright, heart-shaped region. If people had predicted that there'd be a region the shape of a heart in the middle of the encounter flyby area, we would've never believed them. This region is scientifically very interesting. You see it's very smooth and it has these polygonal shapes. It's got interesting exotic ices on the surface there. It's telling us a lot about what Rick was just talking about, about Pluto being a dynamic world. So, I would say Tombaugh Regio and just its presence there was very interesting. Mike Brown: I just want to add that we're all in complete agreement here of the things that we thought we'd see on Pluto. A lot of the times we say, "Everything's a surprise," and it's not really true. There's a lot of stuff that we knew ahead of time. We knew that these ices were on Pluto. We knew that there were dark regions and bright regions, and yet when you see them and you see that this Tombaugh Regio is this very concentrated smooth pile of these very volatile ices that should be evaporating at the equator, that's just very strange and not what anybody would've expected at all. R.B. : Well, I think that's what we find when we go explore. It's the complexity of nature. In fact, the reason why we go explore is because of the complexity of nature being revealed. As Mike said, we knew there were bright regions and dark regions, but seeing how complex they are and how little we understand about what makes them is now this really exciting frontier that we're discovering. TKF: Zooming out from Pluto's surface to the atmosphere, New Horizons has revealed that Pluto is rapidly losing its atmosphere out to space because of its weak gravity. Yet Pluto has somehow maintained an atmosphere. How? M.B. : Can I mention a more mundane potential explanation, which is what we thought for most of the past decade? We wrote a paper a few years ago suggesting that if you just had all these ices there to begin with at the abundances that we know exists in say, comets, that the loss rates on Pluto are such that you would still have the atmosphere there. So, I'm not convinced yet that the atmosphere needs replenishment through some sort of active mechanism. And one of the ways that we sort of show ourselves that we understand this process is by looking at all of the other objects out there in that region of the Kuiper Belt. The largest ones, which had the biggest inventories to begin with, still have those ices on them. They have the methane. They probably have the nitrogen and carbon monoxide. We can't see those as well and as you get just a little bit smaller where they should have lost all of them to space, they don't have them. So, it's not clear to me that active rejuvenation is actually necessary. R.B. : I think what's going on there at Pluto is some of these seasonal effects. You have to realize Pluto's in this eccentric orbit and so it goes as close to the sun as 30 AU and as far as 50 AU. [An "AU," or astronomical unit, is the average distance between the Earth and the Sun.] So you could have times when it's unseasonably warm on Pluto and it gets up to 60 Kelvin [-352 Fahrenheit] or so. R.B. : Exactly. So you can expect that there are times when it's warmer and that some of the more volatile ices will go from the solid phase to the gas phase. And I think historically over time, just depending on what you think about loss rates, maybe Pluto's lost a few kilometers of its upper layers. So, it's not like all of Pluto evaporated. M.B. : I actually think that Rick's point is the key point that didn't get discussed very much during the flyby. Pluto is the most seasonally extreme world I think we've ever visited. So our instincts on what should and shouldn't be there are often not very good. We need to really think about the seasons—what season it is right now, what season it's just been and think about how all these ices move around and how everything moves around because of these seasons. TKF: Looking again now at Pluto's surface, what is throwing up these mountains ranges? What is smoothing out these plains? A viewer has a question if internal heat from Pluto is possibly contributing to all the geological activity that we're witnessing and if so, what might be a source of that heat? R.B. : The compositions of all the bodies in the solar system include radioactive elements. These include very long half-life elements whose ongoing decay continues to generate heat, even to the present day. You can pick up an ancient meteorite, like a carbonaceous chondrite and it's generating heat at a very low rate. So, I think it's not a surprise that any planetary body generates heat mainly from radioactive decay, from isotopes that are still active from the formation of the solar system. I think what's tickling our thinking is it doesn't take very much heat generation to start doing phase changes when phase changes become important at 40 Kelvin or 60 Kelvin. So I don't think it takes anything special. TKF: What do we think could be hiding or erasing so many of Pluto's craters? M.B. : I think the answer to that one is, again, what Rick brought up is that we have huge seasonal variation and the regions without craters are the regions of these very volatile ices that both can move around and can flow. They will easily either cover or evaporate craters. So the whole Tombaugh Regio region shouldn't have craters in it. No one should be surprised not to see the craters there. I think that the most fascinating image that I've seen so far from New Horizons is that one that's just on the edge of Tombaugh Regio, where you're seeing the pile of ice on its edge and then the dark regions that are highly cratered on them. That part to me is what I would've expected to see to have been done by these seasonably variable ices. C.O. : One thing I'd like to add. We have seasonal transport of volatiles and we do see craters in some of the terrains, but also in the Tombaugh Regio region, there'd be relaxation of the ices so that the historical record of the craters wouldn't last as long. That's another factor as well. R.B. : Saying it another way Cathy, the nitrogen ice is relatively soft compared to water ice especially at these temperatures. So if you're dominated by nitrogen, then you will get relaxation on short geologic time scales. TKF: That actually cues up a viewer question: What would it be like to try to ice skate on Pluto? We're talking about exotic ices that we're not at all used to dealing with in any manner here on Earth. What might happen if intrepid human explorers, many decades hence, tried to skate on Pluto's otherworldly ices? M.B. : We had a very long conversation on Twitter amongst many of us on exactly whether you could or could not ice skate on nitrogen ice or methane ice, because there are special properties of frozen water that allows ice skating and sliding on the ices. And water is a weird ice. Actually nitrogen, carbon monoxide and methane are normal ice—water's the weird one. And so, we came to no conclusion about whether you could do it or not. There were arguments both directions. I'd be curious if you could go ice skating. R.B. : Cathy, your colleague there in SwRI, Elliot Young, I thought wrote a paper on this and came somewhat to the conclusion with regard to skiing that you really needed that little "quick" water or liquid transformation right underneath your skis to go fast. M.B. : Apparently, though, that idea for skiing and ice skating has been disproven? This is where the whole conversation on Twitter went. It's not that melting that lets you ice skate, I'm now going to forget what the actual answer is, but that's the one I learned in college and apparently that's all wrong. R.B. : That's what I always thought it was. C.O. : Well, one thing I'd like to say about being able to go ice skating on Pluto is that it would be amazing. If we could go there and actually try it out. We could probably do that experiment somewhere else too. C.O. : That's right. I think that's an interesting question and I really like the idea that we're pushing the limits on our understanding. Pluto is such a different world than Earth. We have such different temperatures, different ices and so these questions that seem so obvious and you'd think, "Well, why isn't the answer known?" That's what science is. Let's all go figure it out. R.B. : If you think about the formation of Pluto and Charon as a giant impact model, then it depends on the population density of the things that could do the impacting. I think it's a stretch even assuming the current age of the solar system, which is 4.5 billion years. Mike certainly knows that population well. M.B. : If the question is, "did the Pluto-Charon impact happen late?" it's nearly impossible to even do it back four and a half billion years ago, because there weren't that many objects available. So, trying to do it any more recently than that is just about impossible. But more importantly, as we were talking about earlier, I think the reasons that we're not seeing the craters on Pluto are actually for all these reasons that we've been talking about. And we haven't talked about Charon, but I think there are interesting reasons there, too. I think it's not because the objects are young or because they have had major geological things happening. I think we're not seeing craters everywhere because of these seasonal reasons and these interesting ices. M.B. : I've been thinking a lot about this one obviously, because these are the things that I study the most. And to me the New Horizons spacecraft is the best chance that we'll get to explore all these objects in the outer solar system. We're not going to send a spacecraft to any of the other ones anytime soon. So it's been really fun to now filter my understanding of the outer solar system through what we're seeing on New Horizons. What we see out there are bodies like Eris that are just about the same size as Pluto, yet a lot more massive. They must have different interiors, but their exteriors are very similar. If you could get to Eris, it's going to have those same ices on it. Is it going to have a mound of nitrogen ice and carbon monoxide ice? I don't know. Now I'd really like to know the answer to that question, but Eris has the same ices. Makemake is sort of just on the other side of Pluto, a little bit smaller, a little bit less massive, but still with big slabs of methane on the surface. And then there are objects that are a little smaller still, which my favorite one to think about these days is Quaoar, which I think of as about halfway between Pluto and Charon. Charon has got this icy cratered terrain with big flows on it. Pluto's got all this methane and ices covering it. Quaoar has some of each and we're now just beginning to think about what these things mean for this whole extended region. This is the exciting part for me. C.O. : Pluto is, as Mike said, the object we got to see up close and it's going to be a very long time before we see any of these other ones. And I can't imagine that the one we chose to see up close is special or unique. We're seeing a lot of dynamics, interesting processes, different things than we perhaps expected on the surface. But I don't have any reason to believe that Pluto would be unique in the Kuiper Belt. So that's telling us about what these other large bodies are like. R.B. : Again, I think it's just the fundamentals of exploration. You go places where your intuition probably fails and I think in a large case our intuition has failed. Not that we got a lot of stuff wrong, it's just the complexities. As a scientist, you just don't let yourself go too far down that complexity chain, because there's so many different complex outcomes that it doesn't become meaningful. And then finally nature reveals what complex path it has chosen and it really is eye-opening for the entire solar system. So New Horizons is going to help us develop a new intuition for the rest of these other bodies. But kind of like siblings, if you have a lot of siblings, you know how different you are from your own siblings. I think each and every one of these objects is going to be their own world and have their own bragging rights. C.O. : One thing that's interesting about Pluto is that we believe that the Pluto and Charon binary system was formed by a giant impact, and that's also how we believe the Earth and the Moon system were formed. So you've taken your sample size from one to two and now we've gotten to look closer up at Pluto and Charon, I'm hopeful that we'll learn more about giant impact processes. R.B. : You go out in the outer solar system and we think about the outer solar system being a deep freeze; the original chemistry of the solar system then hasn't been altered in the way that the Earth has with all of its geologic geophysical properties or processes. We're just going out and looking at frozen time capsules, the beginning of the solar system. So from a chemistry point of view, it's fantastic. Comets are in that category too. I put them very high up in my chemistry curiosity box. R.B. : Great question. I want a Pluto orbiter! M.B. : For 250 years, so we can see Pluto the whole time! R.B. : Exactly. The Rosetta mission, where the European Space Agency went to the Comet 67P/Churyumov–Gerasimenko last year and they're following the comet as it comes closer to the Sun, is just like if you had a long-term, synoptic monitoring of Pluto. And now you start thinking about what are the capabilities of the planned successor to Hubble, the James Webb Space Telescope, to do that? What are the capabilities of even ALMA, this giant radio array in Chile to be able to do that? 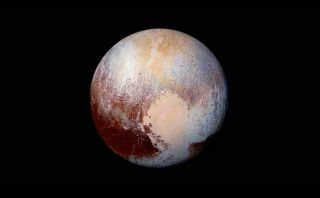 I think that we're going into a new era of synoptic observations of Pluto that's been ongoing for a number of decades, but that certainly now has a lot of renewed interest. C.O. : Also from ground-based astronomy, we knew for years that Pluto was brighter on one of its hemispheres, and now we know the details of what it looks like. We'll be continuing to monitor Pluto. We'll have to go back to our old toolbox of ground-based and Earth-based observing, but we'll be able to look and see how the brightness of Pluto as it rotates changes. That will inform us about the evolution of the Tombaugh Regio. M.B. : If you came back in 30 or 40 years, Tombaugh Regio would look different. I think we can guarantee that those volatiles will move around. But Tombaugh Regio looks so thick that I don't think it's going to come and go on a seasonal time scale. I thought so at first when it first looked like a bright spot. I was like, "There's no way there could be that thick ice there," it's just so thick. Like Rick, I've been thinking about where are we going to get our next set of observations? And the telescopes that I think will actually do the next best job of being able to see this surface are going to be this generation of 30-meter telescopes, which will be able to see Hubble Space Telescope-like images that will at least tell you if that bright spot is still there. They won't tell you if it looks like a heart anymore, or anything else, but if that spot is still there in 30 years, I think we will know from these telescopes on the ground and in space. R.B. : And if I could get a shout out to a lot of our colleagues: There was a substantial effort to try to make ground-based observations in sync with the New Horizons mission. Particularly on June 29th, there was a stellar occultation that vast numbers of observers deployed to New Zealand and Australian for. The SOFIA airplane telescope was successful in observing that as well. So, as Cathy said, we've been monitoring Pluto for decades and there was this huge effort to try to link that data set—the long decades of ground-based with this instantaneous view sent by New Horizons. I think that's really going to pay off as we go forward. It's going to pay off in answering exactly these kind of questions of now that we've seen Pluto, what changes can we detect going on now and for the decades ahead? C.O. : Even just looking at the imagery that we already have down from this spacecraft, you can see evidence that the extent of Tombaugh Regio was different in the past. You can see bright regions in what looks to be like craters. In the bottom of the craters, you could imagine maybe Tombaugh Regio was extended further and then had receded. Or maybe perhaps it's seasonal volatile transport and the volatiles are condensing there on Tombaugh Regio because it's a lower terrain, lower altitude. I think there's evidence that Tombaugh Regio had a different boundary in the past. C.O. : There's so much stuff onboard New Horizons that I just cannot wait to see. One of the things that I'm really looking forward to the most is our high-resolution scan that we took of Pluto with the Alice instrument. Its part of the Ralph instrument and it's the infrared spectrometer. It's going to be able to get high-resolution infrared spectroscopy across the surface of Pluto to map those ices and see what other minor species might be there that we couldn't detect when we were looking at Pluto as a point of light from Earth or using Earth-based observations. That's one I'm really looking forward to getting down. R.B. : There's a very clever observation that we're after. When New Horizons went by Pluto, we turned it around and looked at Pluto using moon's Charon light to illuminate the dark side of Pluto, in fact the southern hemisphere of Pluto that's now in arctic winter. We'll be able to see that south polar cap, and I will really be interested to see the extent of that. M.B. : I'm excited about both of those things that you guys talked about and the one that we keep on avoiding mention of, but the images of Charon. I want to see those global, high-resolution, uncompressed images of Charon and really see where these big cracks have flowed out onto the surface. Maybe we get some composition data on what those flows might have been. I think that is going to tell us a lot about the mid-sized objects that are throughout the Kuiper Belt. There are many, many Charon-like objects out there, and I'd like to learn more about all of them by looking at those images. TKF: Something that we've alluded to in our conversation is just how fundamentally different Pluto is from Earth. When we think of "geology," we think of everyday stuff like hard rock underfoot and water-ice. Way out in the solar system by Pluto, though, there is less rock to begin with, and it's so cold that ice essentially takes over the duties of rock here in the inner solar system. How will we understand these new "ice worlds" versus our "rocky world?"? M.B. : I'll take on that question, but I'm going to flip it and say how similar they are. We think of this as strangely exotic that we have ice instead of rock. But as long as you just think of rock as the hard material underground that's frozen, the rock under our feet could be magma, but it's frozen, so you get many of the same things. I was talking about those flows on Charon. I think of them as big volcanic outbursts on Charon, and what are the volcano's outbursting? Well, it's magma, but on Charon what is magma? Magma is the melted rock, which means water. So, there are these water flows on Charon that if you could imagine them when they happened, if you've ever seen a lava flow on the Earth, it's this beautiful site where you see the molten lava coming in, starting to freeze out on the surface and continue to flow. The same sort of thing would happen. With the ice on Charon, you would get these very similar processes. You would build these structures, like big volcanic dykes. And then on Pluto we talk about the ices, the Tombaugh Regio ices there, which are the nitrogen and carbon monoxide methane ices. They are what we think of as snow around here. It doesn't work perfectly, but you can transfer some of your thinking in that direction and think of Pluto and Earth as more similar in some ways than totally different . . . except they're totally different! C.O. : I'd like to add to that, just thinking about Pluto's atmosphere, because I often think about it as similar and different once again. Both Earth's atmosphere and Pluto's atmosphere are predominantly composed of nitrogen, but Earth's atmosphere is a lot more dense than Pluto's atmosphere, which is about 100,000 times less dense. That causes different processes to be going on. Then we also have hazes. You can have a hazy day on Earth. C.O. : Yes, Los Angeles, that's right. And wildfires have made it kind of hazy here in Colorado, where I am. There's hazes in Pluto's atmosphere that we saw, and it was a really breathtaking image, the one where we were looking back at Pluto from the spacecraft and seeing the extent of those hazes. How they're formed and what they're made of are different, but there's a lot of analogous things to think about when you're comparing Earth and Pluto.